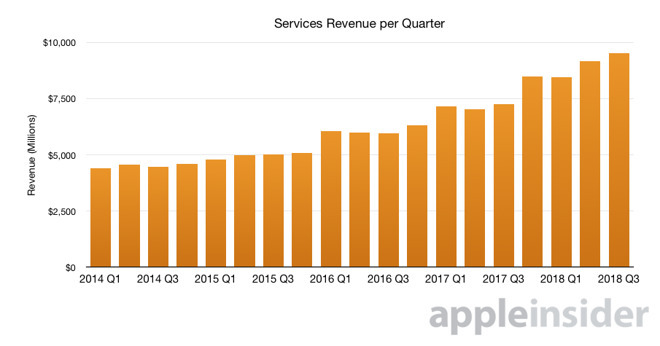 In its third quarter earnings release Tuesday, Apple announced that took in $9.5 billion in services revenue in the three-month period, a new record for the company. The previous record was $9.19 billion put in during the second quarter of this year. The performance beat estimates, as analyst consensus had predicted $9.15 billion in services revenue. Apple's services category includes a variety of different businesses: Digital Content and Services, Apple Pay, AppleCare, licensing and other services, including iTunes, the App Store, AppleMusic and iCloud. Apple did not break out the exact revenue numbers of each division in its earnings release. In an earnings conference call, CEO Tim Cook attributed the strong performance to double-digit growth in Apple's overall active install base, and said the company is on track to double its services revenue by 2020. Apple, Cook said, is up to 300 million paid subscriptions — a 60 percent gain over the last year — as he described subscription revenue as "a significant and increasing percentage of services business." The App Store now boasts some 30,000 subscription apps, and Cook. Cook also said on the earnings call that Apple Music grew 50 percent year over year, while AppleCare grew by its highest rate in 18 quarters. Cloud services also grew more than 50 percent year over year. The CEO added that Apple Pay is now in 24 markets worldwide, and will soon arrive in Germany. When asked by an analyst what Apple's plans for services category are in the future, Cook was optimistic but vague. "We couldn't be happier with how things are going, but in terms of the next leg-given the momentum that we're seeing across the board, we feel great about our current services, but obviously we feel great about our pipeline, with our new services as well. With the combination of these, we feel good," he said. 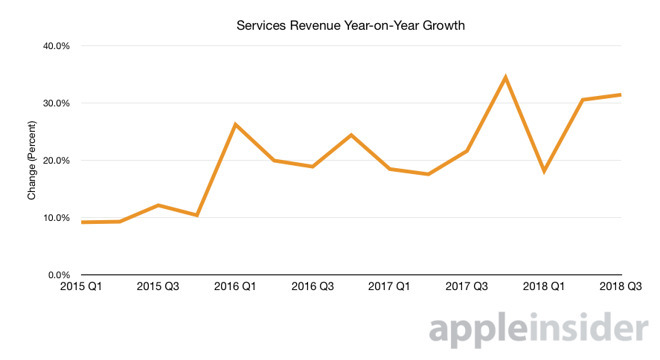 While iPhone remains Apple's most important product category, the surging services sector is emerging as another key to the company's financial performance.